This Built by Wendy dress pattern (Simplicity 3825) was lent to me ages ago by Angelune. I had been wanting to make it with the little sleeve ties and was waiting to find the perfect fabric for it. 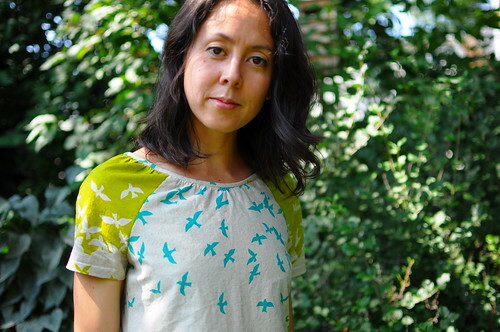 A few weeks ago Karin dropped by the shop with the pattern and bought this green echino fabric for it. I realized I had both that pattern and the green echino fabric at home already. I decided to be a bit of a copy cat. Thanks for the inspiration, Karin! This echino print is so wonderful, the pattern has such a large repeat which is oriented along the crosswise grain, rather than the usual straight grain. Cutting the pattern along the the crosswise grain means that you usually need a bit less fabric for clothing. Though the print comes in a couple other colours, I went for the bright green to match my green Repetto shoes. I’ve seen this fabric made up into an Aline skirt by Kathleen and it’s awesome. Since the echino fabric is a heavier cotton/linen blend, I went with doing a simple short sleeve rather than those cute ties. The stiff drape just wasn’t right for it. It’s been a while since I’ve made a dress with an invisible zipper. All my Japanese Dress Book frocks slip right over my head! Thankfully, I actually enjoy putting zippers in. Maybe that’s weird, but it’s so satisfying. I had cut out the neck yoke, but when I sewed it on, I felt a bit claustrophobic in the dress. I decided to do bias trim around the gathered neckline instead. I’m much happier with it. For my pockets, I used the new techniques that I learned in the Pocket Clinic class. I chose the green Filigree fabric by Anna Maria Horner which matches perfectly. If anything, this dress makes me feel bright and cheery. Perfect for summer days, but perhaps even better when fall starts to creep in. 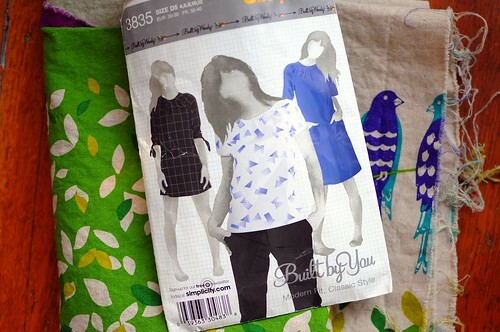 i’m making a dress using this pattern right now! I’m using a blue check japanese linen. I’m pretty excited and (zipper) nervous about it. I’ve already made the simple top using this pattern but will definitely make a dress too. Yours look amazing, what a statement you’ll make when you step out this autumn (fall!). pretty lady! it looks great and you look great! :)looove the fabric. Love it! I haven’t seen that fabric before…I’ll have to keep my eyes open around Vancouver for it. That style looks fabulous on you! Lovely! I’ve been sitting on that pattern for years now and just haven’t found the perfect fabric. You’ve inspired me to wait a little longer to find just the right thing! This dress is stunning! Am inspired to copy-cat, too! I’ve seen the Echino fabrics used mostly in bags and totes. It really shows off beautifully in the simple lines of this dress. Oh and I totally agree about the collar being claustrophobic. I sewed mine on, then took it apart and made it an inch or so wider and it was still too tight so I also went with the bias tape. I want to make a dress with this fabric too! Maybe I should make a skirt. Love the pockets and the color is so fresh!! so lovely as always! Hey there’s that dress!! Super-amazing. Nice to see you today – sorry if I seemed a bit out of it, haha… long day! That dress is so cool– and so inspiring. Thank you for sharing it! Ooh, I have this fabric in purple, as well as the pattern… I really hope I have enough, because this is to die for! I’ve used this pattern too and I thought that exact same thing about the yolk. Every time I put it on I think to myself, did I make this dress wrong?! Good to know I’m not the only one! 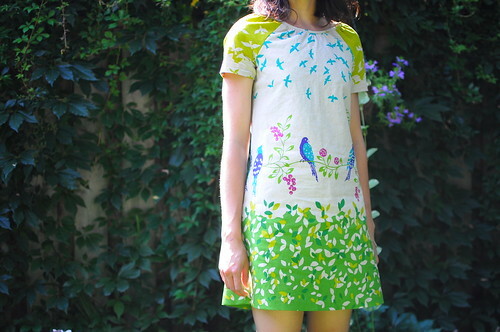 I love how simple it is, perfect for a showy print like Echino. I like yours better than mine! Maybe I’ll do another with a different neckline. Thanks!